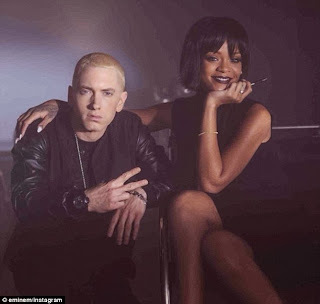 Rihanna and Eminem on set in Detroit for Em's Monster video. They're breaking records with their latest duet, The Monster. But Rihanna and Eminem aren't giving anything away about the video that will accompany the hit. However, the pair did give their fans a glimpse of themselves on set when they shared a snap via Twitter on Wednesday. Clad in what appeared to be a sleeveless black dress, Rihanna showed off her chic new bob as she smiled into the camera, her chin resting on her hand. Wearing vampy dark lipstick, the 25-year-old draped a languid arm around the shoulders of her collaborator. Crouching next to the seated singer, a leather-clad Eminem pulled a peace sign as he stared moodily ahead. Although he's now 41-years-old, the Berzerk rapper barely looked a day older than he did when he first shot to fame with The Slim Shady LP in 1999. Shooting in the Stan singer's hometown of Detroit, the latest flick from the The Marshall Mathers LP 2 is being directed by Rich Lee, who also shot Not Afraid and Lighters. If their last video together is anything to go by, fans of the single will be in for a treat. In the visuals for Love The Way You Lie, Megan Fox and Lost's Dominic Monaghan starred as a pair of violent lovers, while Eminem rapped in front of a burning building. Rihanna shared the fiery backdrop, wearing an extremely low-cut top and sporting a bright red pixie crop.